The work involves synthesis of new quinolin-2-one Schiff bases (XIII)a,b and (XIV)a,b, pyrazoles (XI)a,b and pyrazolines (XII)a,b derivatives containing isoxazoline or pyrimidine cycle starting with chalcones. 3-Aminoacetophenone was reacted with 4-bromobenzaldehyde or 4-N,N-dimethyl aminobenzaldehyde in basic medium to give chalcones (I)a,b by Claisen-Schemidt reaction. These chalcons were reacted with hydroxylamine hydrochloride or with thiourea in basic medium to form isoxazolines (II)a,b or pyrimidine-2-thion (III)a,b ,respectively.Also the pyrimidine-2-thiones (III)a,b and isoxazolines (II)a,b reacted with 4-or 3-substituted benzaldehyde and coumarin to form Schiff bases (IV)a-f (V)a-f and quinoline derivatives (VII)a-d(VIII)a-d, respectively. On the other hand, compounds (V)b,f were reacted with ethylchloroacetate in basic medium to give ester compounds (IX)a,b .The condensation of new esters (IX)a,b with hydrazine hydrate led to produce new acid hydrazides (X)a,b.The later compound refluxing with 4-substituted benzaldehyde in dry benzene to give Schiff bases (XIII)a,band (XIV)a,b while the reaction of acid hydrazides (X)a,b with acetyl acetone or ethyl aceto acetate led to formation of pyrazole (XI)a,b , pyrazoline (XII)a,b ,respectively. The synthesized compounds were characterized by melting points, FTIR,C.H.N.analysis, Mass and 1H NMR spectroscopy(of someof them) Some of the synthesized compounds have been screened for their antibacterial activities using two types of bacteria; E. Coli and Staph. aureus. All the examined compounds did not show any biological activity towards E. Coli but compound (VII)a showed activity towards Staph. aureus.یتضمن هذا البحث تحضیر مشتقات جديدة لكوينولين-2-اون وقواعد شف (XIII)a,bو (XIV)a,bو بايرازول (XI)a,b وبايرازولين(XII)a,b تحتوي على وحدة الايزوكسازولين و البيريميدين بأستعمال الجالكون كمادة أساسية ,يحضر الجالكون من تفاعل3-أمينوأسيتوفينون مع 4-برومو بنزالديهايد أو4- N,Nثنائي مثيل أمينو بنزالديهايد في وسط قاعدي . یتفاعل الجالكون (I)a,b مع هيدروكسيل أمين هايدروكلورايد او مع الثايويوريا في وسط قاعدي ليعطي الايزوكسازولين a,b (II) أو البيرميدين-2-ثايون على التوالي أيضا تمت مفاعلة البيرمدين (III)a,b أو الايزوكسازولين a,b (II) مع الديهايدات اروماتية معوضة أو مع الكيومارين لنحصل على قواعد شف جديدة (IV)a-f (V)a-f ومشتقات الكوينولين(VIII)a-d ,(VII)a-d ، على التوالي . ومن تكثيف المركبات f (V)b, مع أثيل كلورو أسيتيت في وسط قاعدي حصلنا على مركبات أسترية والتي تم تكثيفها مع الهايدرازين للحصول على الهايدرازايد a,b (X) الذي يصعد مع البنزلديهايد المعوض ليعطي قواعد شيف (XIII)a,b و. (XIV)a,b واخيرا تم تحضير مركبات البايارازول a,b ((XI و البايارازولون a,b (XII) من تفاعل الهايدرازايد مع أستيل أسيتون أو أثيل أسيتو أستيت على التوالي. شخصت جميع المركبات المحضرة بوساطة قياس درجات أنصهارها ومن التحليل الدقيق للعناصر و طيف FTIR و طيف الكتلة و1H NMR(لبعض منها) كما درست الفعالية البايولوجية لبعض من المركبات المحضرة ضد نوعين من البكتريا وهيS. aureus و E.coli ولم تظهر جميع المركبات المدروسة اي فعالية بايولوجية تجاة البكتريا السالبة E.coli بينما اظهر المركب(VII)a فعالية تجاة البكتريا الموجبة .S. aureus. Chalcones --- Schiff bases --- Isoxazoline --- Pyrimidine --- Quinolone --- Pyrazole --- Pyrazoline. PM3 semiempirical method and Density Functional Theory (DFT) calculations of the type (B3LYP) and a Gaussian basis set (6-311G) were carried out for fullerene C60 molecule with its construction units (5radialene, 1,2,3-trimethylene indan, and corannulene), to evaluate the geometrical structure (bond lengths, symmetry, and energetic such as heat of formation ΔH0f, total energy Etot., dipole moment μ, EHOMO (highest occupied molecular orbital energy), ELUMO (lowest unoccupied molecular orbital energy), energy gap ΔEHOMO-LUMO), the distribution of electron density and vibration frequencies, all at their equilibrium geometries. Assignment of the vibrations modes was done according to the movement of the atoms as a result of DFT calculation using Gaussian program view. Comparison was done for the distribution of electron density with the expense of vibration frequencies and for the relationship of all the physical and electronic properties of fullerene C60 with its construction unitsتم استخدام حسابات ميكانيك الكم التقريبية PM3 والعائدة لنظرية دوال الكثافةDFT الأساسية لعناصر قاعدة6-311G وباسلوب B3LYP وباستخدام برنامج Gaussian-09 في حساب الشكل الهندسي التوازني لجزيئة الفلرين مع وحدات بناءها (5radialene, 1,2,3-trimethylene indan, corannulene) وذلك بغرض حساب أطوال التأصر والتماثل وبعض الصفات الطاقية والفيزياوية كحرارة التكوين القياسية ΔH0f والطاقة الكلية Etot وعزم ثنائي القطب μ وطاقة اعلى مدار محجوز بالالكترونات EHOMO، وطاقة اوطأ مدار غير محجوز بالالكترونات ELUMO، والفرق الطافي بينهما ΔEHOMO-LUMO، وتوزيع الكثافة الالكترونية مع حساب وتصنيف ترددات الاهتزاز تكافؤيا وتماثليا لجزيئة الفلرين وفق نظرية المجموعة ودراسة علاقة كل ذلك بالخواص الفيزيائية والالكترونية لهذه الجزيئة مع وحدات بنائها. Fullerene molecule --- physical properties --- energetic --- vibrations frequencies. Four new phenol-formaldehyde resins containing tetrachlorophthalimides in their repeating units were synthesized via condensation of formaldehyde with N-(hydroxy phenyl)tetrachlorophthalimides under conditions similar to those used in novolac preparation. In this work structural modifications were performed first via design and synthesis of new phenolic component represented by phenolic ring linked to thermally stable tetrachlorophthalimide moiety which condense with formaldehyde and second via introducing of phenolic hydroxyl groups present in the new synthesized resins by esterification reaction with acetyl chloride producing the corresponding acetoxy substituted resins. Both the prepared and the cured resins have new properties which may serve different applications.تم في هذا البحث تحضير اربعة راتنجات فينولية جديدة معوضة بمجاميع متدلية من رباعي كلوروفثال ايمايد في وحداتها المتكررة وذلك من خلال تكاثف الفورمالديهايد مع مركبات N-(هيدروكسي فنيل)رباعي كلوروفثال ايمايدات تحت ظروف مماثلة لظروف تحضير النوفولاك. تم انجاز التحوير التركيبي في هذه التحاضير من خلال تحضير مكونة فينولية جديدة متمثلة بحلقة فينول مرتبطة بمكونة رباعي كلوروفثال ايمايد المستقرة حرارياً ثم ادخالها في تفاعل تكاثف مع الفورمالديهايد. اما التحوير التركيبي الثاني فقد تم انجازه من خلال معالجة الراتنجات الفينولية المحضرة وذلك بادخال مجاميع الهيدروكسي المعوضة اساساً في حلقاتها في تفاعل استرة مع كلوريد الاستيل مما اسفر عن تكوين راتنجات فينولية معوضة بمجاميع الاسيتوكسي. امتازت كل من الراتنجات المحضرة والراتنجات بعد المعالجة بمواصفات جديدة مما قد يسمح باستخدامها في تطبيقات مختلفة. Aimed this study to testing some of growth conditions on inhibitory activity of Lactobacillus delbrueckii bacteria and L.fermentum at various concentrations (50, 70, 90, 100) % on the growth of E.coli isolate used in this study. The results showed that the bacteria L. delbrueckii and L.fermentum at 100% concentrations gave highest inhibitory activity against E.coli with inhibition zone 27mm , while inhibition zone reached 17 mm at 50% concentration and when using a bacterial filtrate of L. delbrueckii and L.fermentum at 100% concentrations inhibition zone was with diameter 23mm , also stability of bactiriocin was examined against pH values, the results showed that highest stability in acidic PH compared to alkaline PH. The treatment of bacteriocins with salts suchas NaCl and KCl revealed low effect in inhibition zone with 1 & 5% concetrations. However the higher concentration of salt 5% caused high reduction and caused to loss of inhibitory activity of bacteriocins compared to1% with inhibition zone diameter were 16 and 18 mm for Nacl and Kcl at 1% while it decreased to 14 and 15 mm at % 5 . The results showed that stability of bacteriocins at temperature 37 ºC than 25 ºCهدفت هذه الدراسة لاختبار تاثير بعض ظروف النمو على الفاعلية التثبيطية لبكتيريا Lactobacillus delbrueckii و L.fermentum على نمو بكتيريا E.coli وقد دلت نتائج دراسة اختبار الفاعلية التثبيطية للعزلتان البكتيريتان Lactobacillus delbrueckii L.fermentum , ضد العزلة البكترية E.coli المستخدمة في هذه الدراسة عند التراكيز المختلفة 100,90,70,50) ) % بان عالق العزلتان البكتيريتان Lactobacillus delbrueckii و L.fermentum عند التركيز % 100 اعطى اعلى فاعلية تثبيطية ضد بكتريا E.coli حيث بلغ معدل قطر منطقة التثبيط 27 ملم ، بينما بلغ معدل قطر منطقة التثبيط 17 ملم عند التركيز%50 كفاعلية تثبيطية لعالق العزلتان البكتيريتان ضد بكتريا E.coli عند استخدام طريقة الحفر، في حين ان راشح العزلتان البكتيريتان Lactobacillus delbrueckii و L.fermentum عند التركيز %100 اعطى منطقة تثبيط قطرها 23 ملم. عند دراسة ثباتية البكتريوسين تجاه التغاير في قيم الاس الهيدروجيني ، اظهرت النتائج ثباتية البكتريوسين المنتج عند قيم الاس الهايدروجيني الحامضي من خلال قطر منطقة التثبيط لبكتريا E.coli 22 ملم في حين انها بلغت 17 ملم عند قيم الاس الهايدروجيني القاعدي. في حين ان نتائج اختبار تاثير كل من الملحين NaCl و KCl عند التركيزين 1 و 5 % في فاعلية البكتريوسين بينت ان فاعليته التثبيطية ضد بكتيريا E.coli كانت اعلى عند التراكيز الملحية الواطئة 1% مقارنة بفعله عند التراكيز الملحية العالية% 5 من خلال نتائج اقطار مناطق التثبيط والتي كانت 16 و 18 ملم لكل من الملحين Nacl و Kcl عند التركيز 1 % على التوالي في حين انها انخفضت الى 14 و 15 ملم لكل من الملحين Nacl و Kcl عند التركيز% 5 على التوالي . كما بينت النتائج ثباتية الفعل التثبيطي للبكتريوسين المنتج من قبل بكتريا Lactobacillus عند درجة الحرارة 37 مº في حين انه انعدم عند درجة الحرارة 25 مº. Wheat (Triticum aestivum L.) is one of the Poaceae family (Gramineae). Is momentous for human nutrition, and the stresses can affect strongly on the phenotype characteristics of the plant. The aim of this study was to determine how electric shock on germinated grain (for 2.5, 5, and 7.5 mins.) and heat shock at ( 35 oC, 40 oC and 45 oC) applied after phase out the radical length of 2-5 mm, from the grain of two wheat Varieties: “Baghdad 1” and “Babylon 113”. The electric shock for 2.5 mins., lead to delay of flowering, from day to 50 % flowering was 93 day, as well as, gave lowest value of plant height 64.5cm and lowest spike length was 10.7 cm. While The highest flag leaf area was obtained by electric shock for 5 mins. was 56.6 cm2 compared to control treatment which was 28.9 cm2. The effects of heat shock at 45 oC, gave maximum plant heights was 78.3 cm and highest spike length was 15.3 cm. In response to electric and heat stress in both varieties, clear differences were observed. Baghdad 1 variety gave the minimum days from sowing date to 50% flowering was 84.85 day and maximum plant height rate 73 cm, while highest rate of flag leaf area 48.1 cm2 and highest spike length was 13.8 cm, by Babylon 113 variety. There is significant interaction between varieties and treatments, Babylon 113 for Es 5 minutes, gave highest value of flag leaf area was 65.8 cm2, and highest spike length 16.7 cm,. Whereas Babylon 113 for Es 2.5 minutes, gave maximum days to 50% flowering which was 93 day, lowest value of plant height 60.5 cm, and lowest spike length 10 cm.حنطة الخبز(Triticum aestivum L.) من العائلة العشبية (النجيلية). بالغ الأهمية لتغذية الإنسان، والإجهاد يمكن أَن يؤثر وبقوة على الصفات المظهرية للنبات. هدف الدراسة تحديد تأثير الصعق الكهربائي على الحبوب النامية بفترات (2.5و 5 و7.5 دقيقة ) والصعق الحراري في (35 مo و 40 مo و45 مo) طبقت بعد مرحلة ظهور الجذير بطول 2-5 ملم. لصنفين من الحنطة هما "بغداد 1 "و" بابل 113 ".أظهرت النتائج الصدمة الكهربائية ل2.5 دقيقةِ. أدت الى التأخير في التزهير 50 % تزهير بلغ 93 يوم بالإضافة الى أقل إرتفاع نبات 64.5 سم وأقل طول سنبلة بلغ 10.7 سم. بينما مساحة ورقة العلم الأعلى حصل عليها بالصدمة الكهربائية 5 دقائق. بلغت 56.6 سم2 مقارنة بمعاملة السيطرة التي كانت 28.9 سم2 . في حين تأثير الصعق الحراري عند 45 مo ، أعطى أعلى أرتفاع نباتِ بلغ 78.3 سم وأعلى طولَ سنبلة بلغ 15.3 سم. الأستجابة للصعق الكهربائيِ و الحرارة لكلا الصنفان، الإختلافات لوحظت. أعطى صنف بغداد 1 أقل أيام من تأريخِ البذر إلى 50 % تزهير بلغت 84.85 يوم وأقصى أرتفاع نبات 73 سم، بينما أعلى مساحة ورقة علم 48.1 سم2 و أعلى طول سنبلة كان 13.8 سم، للصنف بابل 113. وجد هناك تداخل معنوي بين الاصناف والمعاملات، الصنف بابل 113 والصعق الكهربائي لمدة 5 دقائق، أعطى أعلى مساحة ورقة علم بلغت 65.8 سم2، و أعلى طول سنبلة 16.7 سم،. بينما الصنف بابل 113 والصعق الكهربائي لمدة 2.5 دقيقة، أعطى أقصى أيام إلى 50 % تزهير الذي كان 93 يوم وأقل إرتفاع نبات 60.5 سم، وأقل طول سنبلة 10 سم. In this study, 25 clinical isolates of Proteus spp. were collected from urine, wounds and burns specimens from different hospitals in Baghdad city, all isolates were identified by using different bacteriological media, biochemical assays and Vitek-2 system. It was found that 15 (60%) isolates were identifies as Proteus mirabilis and 10 (40 %) isolates were Proteus vulgaris. The susceptibility of P. mirabilis and P. vulgaris isolates towards cefotaxime was (66.6 %) and (44.4 %) respectively; while the susceptibility of P. mirabilis and P. vulgaris isolates towards ceftazidime was (20%). Extended spectrum β-lactamses producing Proteus was (30.7 %). DNA of 10 isolates of P. mirabilis and 4 isolates of P. vulgaris were extracted and detection of (blaCTX-M-1, blaCTX-M-2, blaCTX-M-8 and blaCTX-M-9) was done by multiplex polymerase chain reaction (PCR). Results showed the presence of blaCTX-M-2 gene, which is responsible for resistance to cefotaxime in these isolates, while no other types of , blaCTX-M genes were found in them.في هذه الدراسة تم جمع 25 عزلة سريرية من جنس بكتيريا المتقلبات Proteusمن عينات مختلفة من الادرار، والحروق، والجروح من عدد من مستشفيات مدينة بغداد، تم تشخيص العزلات باستخدام الاوساط البكتيريولوجية والاختبارات البايوكيميائية ونظام Vitek-2، شُخصت 15 عزلة (60 %) لنوع P. mirabilis و 10 عزلات (40 %) لنوع P. vulgaris. كانت نسبة مقاومة عزلات الـ P. mirabilis لمضاد السيفوتاكسيم 66.6 %)) ونسبة مقاومة عزلات الـ P. vulgaris (44.4%) بينما كانت نسبة المقاومة 20%لكلا النوعين لمضاد السيفتازيديم، وكانت نسبة العزلات المنتجة لانزيمات واسعة الطيف 30.7 %. تم استخلاص المادة الوراثية DNA من 10 عزلات من P. mirabilis 4 عزلات من P. vulgaris والتحري عن المورثات المشفرة لـ (blaCTX-M-1, blaCTX-M-2, blaCTX-M-8, blaCTX-M-9) بواسطة تقنية تفاعل الكوثرة، اظهرت النتاىج وجود المورث المشفر للـ blaCTX-M-2 المسؤول عن مقاومة مضاد السيفوتاكسيم في هذه العزلات في حين لم يتم العثور على الانواع الاخرى التابعة للمورثات المشفرة لـ blaCTX-M.
A laboratory study was conducted to evaluate the effect of crud extracts from seven plant species (Nigella sativa, Eugenia caryophylota, Corianderum sativum, Piper nigrum, Peganum hermala, Achillea santolina, Citrullus colocynthis) belong to different families tested as food feeding toxicity against adult of Oryzaephilus surinamensis. The results of the current study showed that hexane extracts from all plants used were more influential in all used concentrations than, the alcoholic extract, and hexane extract of Hanzal was more effective reaching survival rate of adult to 58.3% at concentration of 10% then the plant yarrow and black pepper about 66.2%, and 67.3% respectively, at the same concentration. While the survival rate was approximate in black bean, cloves, and rue at the same concentration 76.4%, 71.3%, and 77.3%. Respectively. The alcoholic extract of Hanzal was less effects on the survival of the adults it 70.0%, while the coriander plant least in fluently of all plants used in the study, as were 80%. In additional to the toxic action and anti-fed ant effect, preliminary results indicated that many of plant extracts have potential in giving good protections of stored plant from attacking by insect, they are indigenous and many be safe and readily available to protection granaries from attacking by insect pestes.اجريت دراسة مختبرية لتقييم التأثير بعض المستخلصات الخام من سبع انواع من النباتات التي تعود لعوائل مختلفة في بالغات خنفساء الحبوب المنشارية Oryzaephilus surinamensis. بينت نتائج الدراسة ان المستخلص الهكساني لجميع النباتات المستخدمة في الدراسة (Nigella sativa, Eugenia caryophylota, Corianderum sativum, Piper nigrum, Peganum hermala, Achillea santolina, Citrullus colocynthis) كانت أكثر تأثيرا وفي جميع التراكيز المستعملة من المستخلص الكحولي. وان المستخلص الهكساني لنبات الحنظل كانت اكثر فعالية, اذ بلغ نسبة بقاء البالغات 58.3 % عند التركيز 10% , ثم نبات القيصوم والفلفل الاسود اذ بلغ 66.2% و 67.3% على التوالي عند نفس التركيز في حين نسبة البقاء كانت متقاربة في النباتات الحبة السوداء, القرنفل, والحرمل وعند نفس التركيز اذ بلغت 76.4% , 71.3%,77.3% على التوالي. اما المستخلص الكحولي فكان اقل تأثير على بقاء البالغات وان نبات الحنظل ايضا كان اكثر تأثيرا في البالغات من النباتات الاخرى, اذ كانت نسبة بقاء البالغات 70.0% في حين نبات الكزبرة الاقل تأثيرا من بين جميع النباتات المستخدمة في الدراسة اذ بلغ 80.0%, 92.9% عند نفس التركيز المذكور للمستخلص الهكساني والكحولي على التوالي. وتبين من خلال الدراسة امكانية استخدام هذه النباتات كمصادر طبيعية لمكافحة قد تكون سليمة بيئيا والتي يمكن ادراجها في برامج وقاية آفات مخازن الحبوب من الافات الحشرية. plants --- alcoholic extract --- hexane extract --- Control --- coleopteran silvanaidae. Hepatitis B virus (HBV) infection is a global public health problem. It is estimated that there are 240 million HBV carriers in the world, of whom roughly 600,000 die annually from HBV-related liver disease. A total of 150 individuals were included in this study, 130 individuals of them had hepatitis B infection (patients group); HBs-Ag was detected in their sera by enzyme linked immunosorbent assay (ELISA) technique and was confirmed by real time PCR analysis to detect the viral genetic material, the others were control. Most of HBV patients in this study were located within 20-40 years group with a percentage of 47.7% and within the 40-60 years group with a percentage of 38.5%. Acute infection was confirmed by detection of anti-HBc IgM antibodies, they were significantly higher (P<0.05) in acute hepatitis B patients than other groups in this study. Although there were no significant differences in biochemical tests, TSB, AST, ALT and ALP concentrations between study groups, the concentration levels of TSB, AST and ALT were higher than normal value in acute and chronic without treatment hepatitis B infected groups. Toll like receptor-2(TLR-2) serum levels were upregulated in hepatitis B patients, it was significantly higher (p≤ 0.001) in Hepatitis B infected patients than control. The highest level was in chronic hepatitis B patients without treatment, chronic with treatment, acute, then carrier groups. Indicating that, TLR2 might participate in the pathogenesis of HBV infection, probably through altering the innate immune responses during infection يعد خمج التهاب الكبد الفايروسي من المشاكل الصحيه العامه على الصعيد العالمي حيث يقدر عدد الحاملين لهذا المرض بالعالم ب 240 مليون منهم ما يقارب 600 الف مريض يموتون سنويا بامراض الكبد التي لها علاقه بالتهاب الكبد الفايروسي نوع B. شملت الدراسة على 150 فرد منهم 130مرضى مصابون بالتهاب الكبد الفايروسي نوعB . اغلب المرضى اعمارهم تتراوح مابين20 – 40 سنة وبنسبة 47,7 % و مابين 40 – 60 سنة بنسبة 38,5 %. تم تشخيصهم عن طريق كشف HBs- Ag في مصل المرضى بواسطة استخدام تقنية التحري المناعي الممتز المرتبط بالأنزيم وتأكيد الاصابة بالكشف عن المادة الوراثية للفايرس بتقنية التفاعل عديد البلمره. التهاب الكبد الفايروسي B الحاد تم تاكيده من خلال الكشف عن Anti-HBc IgM في مصول المرضى وكان مرتفع معنويا (0.05 > p) لديهم مقارنة بالمجاميع الاخرى. بالرغم من عدم وجود اختلافات معنوية بتراكيز الفحوصات الكيمياويه TSB)و ALTو AST و (ALP بين المجاميع المدروسه الا ان مستوياتها اعلى من المستويات الطبيعية في مرضى التهاب الكبد الفايرسي B الحاد والمزمن بدون علاج. كما ان مستويات TLR-2في مصول مرضى التهاب الكبد الفايروسي B كانت غير منتظمه و مرتفعه معنويا (0.001 > p) مقارنة بعينات السيطرة. أعلى مستوى لل TLR-2 كان في مرضى التهاب الكبد الفايروسي نوع B المزمن بدون العلاج , وبعدها مرضى التهاب الكبد الفايروسي نوع B المزمن اللذين يتعاطون العلاج, ومن ثم المرضى من النوع الحاد واخيرا الحاملين للمرض. مما يشيرالى احتماليه اشتراك TLR-2 في امراضيه التهاب الكبد الفايروسي نوع B من خلال تغيير الاستجابه المناعيه الطبيعيه اثناء الخمج. Hepatitis B virus --- Toll-like receptor --- anti-HBc IgM antibodies --- biochemical tests. The present study was aimed to screen the ability of local isolates of Bacillus spp. (56 isolates) for nattokinase production using solid state fermentation, then optimize the nutritional conditions for enzyme production. The isolates were subjected to the primary and secondary screening process to select the Bacillus isolate which give the highest production of enzyme. It was found that Bacillus sp. B24 had the highest productivity of the enzyme (25.58U/mg protein). The optimum conditions for nattokinase production were performed by the solid state fermentation and found that the wheat bran was the best medium at initial moisture ratio 1.0:1.0 (w/v) using distilled water as moisturizing solution with initial pH of 7.0 after inoculation with 5×107 cell/ml for 72 hrs, the enzyme specific activity was 38.65U/mg proteinهدفت هذه الدراسة الى غربلة العزلات المحلية لبكتريا Bacillus spp (56 عزلة) المنتجة لانزيم الناتوكاينيز بوساطة تخمرات الحالة الصلبة فضلا عن تحديد الظروف المثلى لانتاج الانزيم. خضعت هذه العزلات الى الغربلة الاولية والثانوية لاختيار العزلة الاغزر انتاجا للانزيم. وجد ان العزلة Bacillus sp. B24 امتلكت اعلى انتاجية للانزيم حيث بلغت الفعالية النوعية للانزيم 25.58وحدة/ملغم بروتين. كانت الظروف المثلى لانتاج الانزيم من العزلة المنتجة بوساطة تخمرات الحالة الصلبة باستعمال وسط نخالة الحنطة المرطبة بالماء المقطر بنسبة 1:1 (وزن/حجم) رقم هيدروجيني ابتدائي 7.0 وحجم لقاح 5×107 خلية/مل بعد فترة حضن 72 ساعة وتم الحصول على فعالية نوعية للانزيم 38.65 وحدة/ملغم بروتين. Bacillus B24 --- Nattokinase --- enzyme screening --- optimization. In this study, concentrations of Radon were measured for fifty two samples of Fly Ash taken from five thermal power plants in the middle and south of Iraq [Al-Rashed, Al-Dura, Al-Musaeb, Al-Naserya, Al-Basrah (AlHaretha)]. The radon concentrations in samples measured by registrat alpha-emitting radon (222Rn) by using (CR-39) track detector, The concentrations values were calculated by a comparison with standard samples The results shows that the radon concentrations is between (91.931-30.645 Bq/m3) تم في هذا البحث قياس تراكيز غاز الرادون لاثنان وخمسون عينة من عينات الرماد المتطاير المأخوذة من المحطات الحراريه الكهربائية في وسط وجنوب العراق (الرشيد, الدورة, المسيب, الناصرية, البصرة (الهارثة)) وتم ايجاد تراكيز الرادون Rn222عن طريق تسجيلِ اثار بواعث ألفا المنبعثة من غاز الرادون (222Rn) في كاشِف الأثر النووي (CR-39) تم تحديد التراكيز بالحسابات المعتمدة بالمقارنة مع العينات القياسية، ومن خلال النتائج المستحصلة وجد ان تراكيز الرادون ترواحت مابين 91.931-30.645) Bq/m3 ). In present work, the nonlinear optical properties of pure polyaniline and Ag/polyaniline nanocomposite thin films, deposited by plasma jet on glass substrate, were studied through open and closed Z-scan technique using pulse second harmonic Nd:YAG laser of wavelength 532nm, pulse duration of 30 ns and input energy 30mJ. The nonlinear optical properties of pure polyaniline thin films and silver polyaniline nanocomposite thin films prepared at constant gas flow rate 1lm-1 and different silver weight concentration 4, 5, and 10% were studied. The closed aperture Z-scan data indicates that the sign of the refraction nonlinearity is negative for pure polyaniline thin films n2 =11×10-3 cm2/MW and positive nonlinearity for Ag/polyaniline nanocomposite thin films, n2=72×10-3, 66×10-3 and 96×10-3 cm2/MW for silver weight concentration 4, 5, and 10% respectively. The open Z-scan measurements show two photons absorption β=75×103 cm/MW for 4%wt silver concentration and show saturated absorption for pure polyaniline, 5 and 10%wt silver concentration. The transmission spectra obtained by UV-Visible absorption spectra exhibit interference fringes, for the samples with 4% and 5%wt silver concentration which is an indication of the good uniformity and homogeneity of the films.في هذا العمل تم دراسة الخواص البصرية غير الخطية لاغشية متراكبات فضة متعدد الانلين النقية ومتراكبات فضة متعدد الانيلين الرقيقة النانوية التي رسبت ببلازما النفث على قواعد من الزجاج ،هذه الخوص انجزت باستعمال تقنية المسح بالبعد الثالث بوجود حاجز وبدون حاجز وقد استعمل لهذا الغرض ليزر نديميوم ياك عند الترد التوافقي الثاني ذو الطول الموجي 532 نانو متر، وزمن نبضة 30 نانوثانية وطاقة 30 ملي جول. حيث درست الخواص البصرية غير الخطية للاغشية الرقيقة لمتعدد الانلين النقي ولمتراكبات فضة متعدد الانلين الرقيقة النانوية المحضرة عند معدل جريان ثابت للغازمقداره واحد لتر لكل دقيقة وتراكيز وزنية مختلفة من الفضة هي 4 و 5 و 10٪. نتائج المسح بالبعد الثالث بوجود حاجز بينت أن اشارة الانكسار غير الخطي سالبة لأغشية البولي آنلين النقية n2 =11×10-3 cm2/MW وموجبة لاغشية متراكبات فضة متعدد الانلين الرقيقة النانوية n2=72×10-3, 66×10-3 , 96×10-3 cm2/MW عند تراكيز الفضة 4 و5 و10% على التوالي. ونتائج المسح بدون وجود الحاجز بينت امتصاص فوتونين حيث β=75×103 cm/MW عند تركيز للفضة 4% واظهرت امتصاص مشبع لتركيزي الفضة 5 و10% ولمتعدد الانلين النقي. طيف النفوذية الذي انجز باستعمال مطياف الاشعة فوق البنفسجية والمرئية احتوى على اهداب تداخل للنموذجين الذي فيهما تركيز الفضة 4 و5% مما يدل على ان هذه الاغشية عالية الانتظام والتجانس. The purpose of this study is the activation of natural Iraqi bentonite that has been obtained from Wadi Bashira region, in the Western Desert of Iraq, to obtain the Nano particle sized then Nano-Quartz was extracted. This method included bentonite nano particles preparation by purification with HCl solution, calcination, the planetary ball mill to get bentonite in nanometer size and centrifugation to obtain the Nano-quartz. Results of quartz purification process were characterized by Fourier transforms infrared spectroscopy (FTIR), energy dispersive X-ray spectroscopy (EDS) and scanning electron microscope (SEM), particle size analyzer (PSA) and the X-rays diffraction (XRD). All tests have shown almost a clear decline in the proportion of the high-calcium in crude Iraqi bentonite in conjunction with an increase in high rates of silica in Quartz phase.الغرض من هذه الدراسة هو تفعيل البنتونيت العراقي الطبيعي الذي تم الحصول عليه من منطقة وادي بشيرة، في الصحراء الغربية من العراق، للحصول على حجم نانوي للجسيمات ثم استخراج النانوكوارتز. تم تنفيذ هذه الطريقة في إعداد جزيئات نانو عن طريق التنقية مع محلول حمض الهيدروكلوريك ، التكليس، مطحنة الكرات الكوكبية للحصول على البنتونايت بحجم النانومتر والطرد المركزي للحصول على نانو الكوارتز. وقد تميزت نتائج عملية تنقية الكوارتز بواسطة التحليل الطيفي للأشعة تحت الحمراء (FTIR)، مطيافية الاشعة السينية المشتتة للطاقة (EDS) والمجهر الإلكتروني الماسح (SEM), محلل حجوم الجسيمات (PSA) و جهازحيود الأشعة السينية (XRD). وقد أظهرت جميع الاختبارات تقريبا انخفاضا واضحا في نسبة الكالسيوم العالية في البنتونيت العراقي الخام بالتزامن مع زيادة في معدلات عالية من السيليكا في طور الكوارتز. Bentonite --- Acidic activation --- Rheological properties --- nano-quartz. Coherent density fluctuation model (CDFM) has been used to calculate the proton momentum distributions (PMD) and elastic electron scattering form factors, F(q), of the ground state for some even mass nuclei of fp-shell, such as 52Cr, 58Fe and 64Ni nuclei. Both of the PMD and F(q) have been expressed in terms of the weight function which is determined by means of the charge density distributions (CDD) of the nuclei and determined from theory and experiment. The feature of the long-tail behavior at high momentum region of the PMD’s has been obtained by both the theoretical and experimental weight functions. The calculated form factors of these nuclei are in reasonable agreement with those of the experimental data.تم استخدام أنموذج تموج الكثافة المترابط في حساب كل من توزيعات زخم البروتون (PMD) للحالة الارضية وعوامل التشكل F(q) للاستطارة الالكترونية المرنة لبعض النوى الزوجية الواقعة ضمن القشرة النووية fp مثل 52Cr، 58Fe و 64Ni. لقد تم التعبير عن كل من PMD و F(q) بدلالة دالة التموج التي تحسب بواسطة توزيعات كثافة الشحنة (CDD). في هذه الدراسة تم حساب دالة التموج من خلال النتائج النظرية والعملية لتوزيعات كثافة الشحنة. تميزت نتائج توزيعات زخم البروتون (المستندة على دالة التموج النظرية والعملية) بخاصية الذيل الطويل عند قيم الزخوم العالية. أظهرت هذه الدراسة بان النتائج النظرية لعوامل التشكل للاستطارة الالكترونية المرنة للنوى 52Cr، 58Fe و 64Ni والمحسوبة بأنموذج التموج المتشاكه تتفق مع النتائج العملية. Proton momentum distributions --- Charge density distributions --- Coherent density fluctuation model. This study was done to examine the concentration of residual chlorine from different regions at AL Risafa side. The samples were collected from Baghdad AL- Jadida, Shareaa Phlistain, AL- Shaab and AL- Habibea, Al-Karrada, Al-Jadria, Al-Adamia at April-August/2013 .The Electrical Conductivity (Ec) and total dissolve solid (TDS), hang about its normal rate according to (WHO) but the Turbidity go beyond it’s limit to reach (11NTU) where the highest peak was recorded in Baghdad AL Jadida. The results show that chlorine concentration were decreased in the August compared with April because of high Temperature, and long in sun shine duration. It is found that there is inverse proportionality between residual chlorine and temperature. Same trend was found between residual chlorine and turbidity. The Conductivity and total dissolved solids of drinking water was within the permitted level according the Iraqi Standers (IQS, 2009).اجريت هذه الدراسة لمعرفة تراكيز الكلور المتبقي في شبكة مياه الشرب في محطات مختارة من مناطق الرصافة . وقد تم جمع نماذج للمياه ومن مناطقها المختلفة، وتشمل بغداد الجديدة، وشارع فلسطين، والشعب، والحبيبية، الكرادة ، الاعظمية ، الجادرية في شهري نيسان واب لعام 2013. لقد حافظت معدلات نتائج التوصيلية الكهربائية(Ec) ، كمية الاملاح الذائبة (TDS) على الحدود المسموح بها بالمقارنة بمواصفات منظمة الصحة العالمية ( (WHO لعينات المياه، وأما بالنسبة للعكورة فقد تجاوزت الحدود السموح بها في بعض المحطات، إذ بلغت أعلى معدلاتها في منطقة بغداد الجديدة (11NTU) خلال فترة الدراسة. ولقد اشارت النتائج الى ان تراكيز الكلور في جمیع المحطات سجلت انخفاضا في شهر آب قیاسا لشهر نیسان بسبب ارتفاع درجات الحرارة وطول فتره التعرض الشمسي. وقد بينت الدراسة ان هناك تناسبا عكسيا بين درجة الحرارة وتراكيز الكلور المتبقي وكذلك فان تركيز الكلور المتبقي يتناسب عكسيا مع الكدرة. فيما كانت التوصيلية الكهربائية وكمية الاملاح الذائبة ضمن المواصفة القياسية العراقية، 2009. The meteorological data recorded in Al-Hilla station for the period (1984-2014) were used to describe the climatic condition of the Greater Musaiyab Project lies in Babylon Governorate, 90Km southern of Baghdad City, central of Iraq. This study found that the summation of rainfall is (112.323 mm), average of relative humidity (47.44%), temperature (25.55 C◦), sunshine (8.748 h/day) and the total of evaporation is (2268.463 mm). In this research, three classifications were applied to find the type of climate in the study area. The results of the climate classification show that, the climate of study area is characterized by dry and relatively hot in summer, and cold with low rain in winter. Thornthwiat equation was used to determine the values of the potential evapotranspiration. This study shows that, there is water surplus of (39.12 %) of the total rainfall amount which is equivalent to (112.323 mm).تم استخدام بيانات الارصاد الجوية المسجلة في محطة مدينة الحلة للفترة (1984-2014) لتقييم الظروف المناخية لمشروع المسيب الكبير الواقع في محافظة بابل ,90كم جنوب محافظة بغداد وسط العراق. حيث بينت الدراسة إن مجموع الساقط المطري يبلـــــغ (112.323 mm)، معدل الرطوبــة النــــــسبية 47.44%))، ودرجــــة الحـــــــــرارة( 25.55C◦)، والســــطوع الشــــمــــسي(8.748 h/day) اما مجموع التبخرمن سطوح حرة بلغ2268.463 mm) ) .تم تطبيق ثلاثة انواع من التصانيف لايجاد نوع المناخ في منطقة الدراسة ,وقد اختيرت لملائمتها لمناخ منطقة الدراسة وقد بينت نتائج تحاليل هذه المعطيات ان مناخ منطقة الدراسة يمتاز بأنه حار جاف صيفا, بارد قليل الامطار شتاءا. كما تم تطبيق معادلة ثورنثويت لايجاد قيم التبخر-نتح الكامن. أظهرت الدراسة وجود زيادة مائية بنسبة (39.12%) من كمية الساقط المطري الكلي الذي يعادل ( 112.323)..
Water balance --- Potential evapotranspiration --- water surplus --- climatic condition. Dujaila River is one of the Tigris River branches, its length is 69.45 km, 15 m width and 2.80 m depth, and discharge rate is 42.15m3/Sec. The river provides the water share for 396 thousand Acres. The primary objective of this study is to evaluate the suitability of water resources, for various purposes in the Dujaila River, Wasit Governorate-central Iraq. Physical and chemical properties have been investigated for 9 surface samples of the period August 2015- March 2016. The tests have been taken for the water major ions, total dissolved solids, electrical conductivity and acidity .Results indicated that the river water is classified as fresh water, according to the total dissolved solid (TDS), which its value ranges between (665-688) ppm in low water season, too (520-575) ppm in high water season, and showed that the Dujaila River water suitable for all purposes. Moreover, all of the water sample types were (Ca+2- sulfate). نهر الدجيله هو احد فروع نهر دجلة، طوله 69.45 كم وعرضه 15 م وعمقه 2.8 م ومعدل التصريف فيه 42.15 م3/ ثانية. النهر يزود اكثر من 396 الف دونماً. تهدف الدراسة الى تقييم مدى ملائمة المياه للاغراض المختلفة في نهر الدجيله محافظة واسط –وسط العراق. تم التحقق من الخواص الفيزيائية والكيميائية لتسع عينات سطحية من مياه نهر الدجيله للفتره مابين (اب 2015- اذار2016) اجريت التحاليل للايونات الرئيسية والمواد الصلبة الكلية والتوصيلية الكهربائية والحامضية. النتائج بينت ان مياه النهر من النوع العذب طبقا الى المواد الذائبة الكلية التي تتراوح مابين (665-668) جزء بالمليون في الموسم الجاف الى (520-575) جزء بالمليون في الموسم الرطب. وبينت الدراسة ان مياه نهر الدجيله ملائمة للاستخدامات المختلفة ,اضافة الى ذلك فأن كل نماذج المياه من نوع كبريتات الكالسيوم. The presence of the "calcite eyes" is related to an internal physiological reason rather than genetically reason or parasite inhabitation. The individual of this family tries to create open spaces in the areas of its body intensively crowded by the main partition or its branches to avoid oxygen scarcity (dysoxic condition). This mechanism keeps the living matter in touch each to the other as well as continuity of the animal life. After death and burial, these created spaces are filled with pure calcite, as it is the case in the chamber passage. This phenomenon took place in both megalospheric and microspheric generations.فسرت ظاهرة وجود "العيون الكلسية" في عائلة Orbitolinidae بأنها تعود إلى سبب داخلي و ليس إلى تأثير جيني أو علاقة طفيلية. يتم ذلك بإستحداث أماكن فارغة لتلافي انسداد الممرات الغرفية )الامر الذي يؤدي الى شحة الاوكسجين( نتيجة تشعب و تفرع الحواجز الرئيسية و بالتالي بقاء المادة الحية على اتصال مع بعضها البعض و استمرار حياة الكائن الحي. ان هذه الفراغات تمتلئ بالكالسايت النقي بعد موت الكائن الحي كما هو الحال في الممرات الغرفية. هذه الظاهرة تحدث في كلا الجيلين الجنسي واللاجنسي. calcite eyes --- Orbitolinidae --- micropaleontology --- Cretaceous --- foraminifera. The aim of this study is to determine and evaluate the units and subunits of Mishrif Formation in Garraf oil field 85 km north of Nasiriyah city depending mainly on the geophysical well logging data and other amiable geological information. The sets of the geophysical well logs data acquired from GA-4, GA- AIP, GA- B8P, GA-3 and GA-5 wells of Garraf oil field are used to determine the petrophysical and lithological properties for each zone in Mishrif Formation to locate, define and evaluate hydrocarbon production from each zone in the reservoir which is also known as formation evaluation. The digitization was done by using Didger software and the interpretations were made using Interactive Petrophysics Program v 3.5 and Petrel software. It is found that middle and Lower parts of Mishrif Formation include several reservoir units (M 1.2, L 1, L 1.2, L 2, L 2.2, L 2.3 and L 2.4) that have been sealed by two cap layers (M 1 and M 2). M 1.2, L 1 and L 1.2 are considered as high quality reservoir units, because they have high values of porosity and hydrocarbon saturation.تهدف هذه الدراسة الى تحديد وتقييم الوحدات الرئيسية والثانوية لتكوين المشرف في حقل الغراف النفطي الذي يقع على بعد 85 كيلومترا شمال مدينة الناصرية وذلك بالاعتماد بشكل رئيسي على بيانات المجسات البئرية الجيوفيزيائية والمعلومات الجيولوجية الأخرى المتوفرة. لقد استخدمت بيانات الجس البئري الجيوفيزيائية المستحصلة من الآبار(GA-5, GA-3, GA-B8P, GA-A1P, GA-4) في حقل الغراف النفطي لأيجاد الخواص البتروفيزيائية والليثولوجية لكل نطاق من انطقة تكوين المشرف لتحديد وتعريف وتقييم الانتاج الهيدروكاربوني لكل نطاق من المستودع والذي يعرف ايضا تقييم التكوين. لقد تم تحويل المجسات الى الصيغة الرقمية باستخدام برنامج (Didger) وتمت عملية التفسير باستخدام برنامج ( Interactive petrophysics V3.5 و (Petrel software . لقد وجد بأن الجزئين الوسطي والأسفل من تكوين المشرف يحتوي على عدة وحدات مكمنية وهي (, L2, L1.2, L1, M1.2 L2.4, L2.3, L2.2) والتي تم تغطيتها بطبقتين غطائيتين هما ( M1وM2 ). لقد اعتبرت الطبقات M 1.2) و L 1 و (L 1.2 وحدات مكمنية عالية الجودة لانها تمتلك قيم عالية من المسامية والتشبع الهيدروكاربوني. To investigate and assess the effects of land use and land cover (LULC) on concentrations of heavy metals in the surface soils of Lesser Zab River Basin (LZRB), 25 surface soil samples were taken from different LULC classes. Heavy metals concentrations were measured and their enrichment factors were calculated. Most of the LZRB soil samples are moderately alkaline with pH>8 and characterized by low organic content. The average abundance of the major oxides follow the decreasing order of SiO2 % > CaO % > Al2O3 % > Fe2O3 %> MgO > K2O % > TiO2 % > Na2O % > SO3 % > P2O5 %. A correlation matrix revealed that clay and feldspar minerals, Fe and Mn oxides / hydroxides are the most important carrier phase for several heavy metals as their correlation of high significant values. The average values of the heavy metal contents are arranged in the following decreasing order: Mn> Cr> Ni>Zn> Cu> Co>Pb>Cd. The LZRB soils exhibits concentration higher than direct geochemical background (DGB), and lower than indirect geochemical background (IGB) and there is a clear difference in the accumulation of heavy metal in soils under different LULC classes. The highest accumulation of heavy metals has been found in agricultural land and next highest concentration in urban and built up land. Assessment of soil contamination is conducted using enrichment factor (Ef), contamination factor (Cf), and contamination degree CD. According to these factors the soils of LZRB showed no or minimal contamination for most metals in different LULC classesلبحث وتقييم تأثير غطاء واستخدامات الارض على تراكيز الفلزات الثقيلة في ترب حوض نهر الزاب الأسفل ، تم جمع 25 نموذجاً للتربة من مختلف اصناف غطاء الأرض و استخدامات الأرض (LULC). تم قياس تراكيز الفلزات الثقيلة واحتساب معامل اغنائها. معظم نماذج التربة متوسطة القلوية مع اس هيدوجيني اكبر من 8 وذات محتوى واطىْ من المواد العضوية. معدل وفرة الأكاسيد الرئيسية وبترتيب تناقصي هو (SiO2 % > CaO % > Al2O3 % > Fe2O3 %> MgO > K2O % > TiO2 % > Na2O % > SO3 % > P2O5%). وكشفت مصفوفة الارتباط بأن المعادن الطينية، معادن الفلدسبار وأكاسيد وهيدروكسيدات الحديد و المنغنيز / هي الطور الرئيسي الحامل للعديد من الفلزات الثقيلة عند قيم الأرتباط العالية. معدل وفرة الفلزات الثقيلة رتبت تنازليا كما يلي (Mn> Cr> Ni>Zn> Cu> Co>Pb>Cd). . أظهرت بعض ترب حوض الزاب الأسفل مستويات مرتفعة من الفلزات الثقيلة، مع تراكيز أعلى من الخلفية الجيوكيميائية المباشرة (DGB) وأقل من الخلفية الجيوكيميائية غير المباشرة (IGB) و أن هناك فرق واضح في تراكم الفلزات الثقيلة في التربة العائدة الى اصناف غطاء وأستخدامات الأرض المختلفة. كما ان الأراضي الزراعية تحتوي على أعلى معدل لتراكم الفلزات الثقيلة ومن ثم المناطق الحضرية. جرى تقييم تلوث التربة باستخدام عامل الأغناء (Ef)، عامل التلوث (Cf)، ودرجة التلوث (CD)، ووفقا لهذه العوامل اظهرت نتائج ترب حوض الزاب الأسفل غياب او وجود الحد الأدنى من التلوث لمعظم الفلزات الثقيلة في اصناف غطاء واستخدامات الأرض. 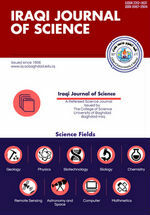 This research deals with study of the Petrology and mineralogy of the Rus and Jil Formations at Najif and Al-Muthanna Governorates, Southern Iraq. The Rus Formation consists mainly of evaporites and subordinate carbonates. The evaporites are characterized by nodular structure (compound wispy, wispy, structureless and mosaic structures) with some laminated structure at the studied sections. Compound wispy to wispy structure are the dominant structures. The Jil Formation consists almost entirely of carbonate. The carbonate rocks are dolomitic limestone and dolomite beds, massive, fossiliferous, cavernous sometime friable and bioturbated in its lower part. The Jil Formation contains evaporites as thin beds, sometimes nodular and contains selenite gypsum and very thin veins of satin-spar. X-ray diffractometry reveals that the non-clay minerals are dominantly dolomite, gypsum and calcite. The clay minerals present in the Rus Formation are: illite, smectite, chlorite and kaolinite. In the Jil Formation the main clay minerals are illite and smectite. The clay minerals are referring to climate arid to semi arid يتناول هذا البحث دراسة الصخارية والمعدنية والعمليات التحويرية لتكويني الرص والجل لعمر الايوسين الاسفل في محافظتي النجف والمثنى جنوب العراق. يتألف تكوين الرص بصورة رئيسية مع نسبة ثانوية من الحجر الجيري. تتميز المتبخرات بالبنية العقدية (خيطي متجمع, خيطي,عديم البنية والبنية الفسيفسائية) مع القليل من البنية المتطبقة في المقاطع قيد الدراسة. البنية الخيطية المتجمعة والخيطية هي السائدة. يتألف تكوين الجل غالبا من الصخور الجيرية. الصخور الكاربونيتية هي حجر جيري مدلمت وحجر مدلمت كتلي و حاوية على المتحجرات و متكهفة و في بعض الاحيان متفتتة ومتعرضة للفعاليات الحياتية في الجزء الاسفل. يحتوي تكوين الجل على طبقات من المتبخرات رقيقة السمك واحيانا عقدية ويحتوي على بلورات الجبس وعروق الجبس الرقيقة السمك. يكشف حيود الأشعة السينية أن المعادن غير الطينية الغالبة هي الدولوميت والجبس والكالسيت. والمعادن الطينية الموجودة في تكوين الرص: اللألايت و السمكتايت و الكلورايت والكاؤلينايت. المعادن الطينية الرئيسية في تكوين الجل هي الألايت والسمكتايت. تشير المعادن الطينية إلى مناخ شبه جاف إلى جاف. carbonate petrology --- Rus Formation --- Jil Formation --- Evaporites. In this paper we introduced a new class of N-CS called Ngsg-CS and study their basic properties in nano topological spaces. We also introduce Ngsg-closure and Ngsg-interior and study some of their fundamental properties.في هذا البحث قدمنا فئة جديدة من مجموعات النانو المغلقة تسمى بمجموعات النانو المعممة شبه المعممة المغلقة و دراسة خصائصها الأساسية في الفضاءات النانو التبولوجية. قدمنا أيضا انغلاق النانو المعممة شبه المعممة و مجموعة النقاط الداخلية النانو المعممة شبه المعممة و دراسة بعض خصائصها الأساسية. This paper is concerned with the existence of a unique state vector solution of a couple nonlinear hyperbolic equations using the Galerkin method when the continuous classical control vector is given, the existence theorem of a continuous classical optimal control vector with equality and inequality vector state constraints is proved, the existence of a unique solution of the adjoint equations associated with the state equations is studied. The Frcéhet derivative of the Hamiltonian is obtained. Finally the theorems of the necessary conditions and the sufficient conditions of optimality of the constrained problem are proved.يهتم هذا البحث بمسألة وجود ووحدانية الحل المتجه للحالة "State Vector " لزوج من المعادلات التفاضلية من النمط الزائدي باستخد, ام طريقة كاليركن"Galerkin" عندما يكون متجه السيطرة التقليدية "Classical control vector" ثابتا" . تم برهان مبرهنة الوجود لسيطرة امثلية مستمرة تقليدية بوجود قيدي التساوي والتباين لمتجه الحالة . كذلك برهان مبرهنة وجود حل وحيد لزوج من المعادلات المرافقة "Adjoint equation" المصاحبة لمعادلات الحالة . تم ايجاد مشتقة فريشيه " Frcéhet" لدالة هاملتون الخاصة بهذه المسالة. ايضا تم برهان مبرهنتا الشروط الضرورية والكافية لوجود متجه سيطرة امثلية مستمرة تقليدية بوجود قيدي التساوي و والتباين. : Classical optimal control --- nonlinear hyperbolic partial differential equations --- necessary and sufficient conditions. The steganography (text in image hiding) methods still considered important issues to the researchers at the present time. The steganography methods were varied in its hiding styles from a simple to complex techniques that are resistant to potential attacks. In current research the attack on the host's secret text problem didn’t considered, but an improved text hiding within the image have highly confidential was proposed and implemented companied with a strong password method, so as to ensure no change will be made in the pixel values of the host image after text hiding. The phrase “highly confidential” denoted to the low suspicious it has been performed may be found in the covered image. The Experimental results show that the covered image pixel (after text hiding) was perfectly match the original image pixels through the use of well-known quantify error metrics like rote mean square MSE and signal to noise ratio PSNR measurements. The experimental results are showed in table for various text sizes to the same cover image. Two digital images types (i.e., low and high details) were used in system evaluation. لاتزال تعتبر طرق الكتابة المخفية (إخفاء نص كتابي في صورة) من القضايا الهامة للباحثين في الوقت الحاضر. وقد تنوعت أساليب إخفاء المعلومات في من تقنيات بسيطة الى المعقدة التي تقاوم الهجمات المحتملة. في البحث الحالي لم يتم الاخذ بنظر الاعتبار اشكالية الهجوم المحتمل على الوسط المضيف للنص السري، ولكن تم اقتراح طريقة معدلة لاخفاء النص السري داخل الصورة تمتلك موثوقية عالية للغاية وتم ربطها مع طريقة كلمة مرور قوية، وذلك لضمان عدم وجود تغيير في قيم عناصر الصورة المضيفة بعد اخفاء النص السري داخلها. أظهرت النتائج التجريبية أن عناصر الصورة المضيفة بعد اخفاء النص السري فيها تتطابق بشكل كبير مع عناصر الصورة الأصلية وتبين ذلك من خلال استخدام مقاييس الخطأ المعروفة مثل مقياس معدل مربع الخطأ ومقياس نسبة الاشارة الى الضجيج. كذلك فقد عرضنا في جدول خاص أحجام مختلفة للنصوص السرية على نفس الصورة المضيفة والتي اشتملت على نوعين من الصور فقط . One of the primary problems in internet is security, mostly when computer utilization is increasing in all social and business areas. So, the secret communications through public and private channels are the major goal of researchers. Information hiding is one of methods to obtain a security communication medium and protecting the data during transmission. This research offers in a new method using two levels to hide, the first level is hiding by embedding and addition but the second level is hiding by injection. The first level embeds a secret message in one bit in the LSB in the FFT and the addition of one kashida. Subtraction of two random images (STRI) is RNG to find positions for hiding within the text. The second level is the injection of one or two random kashida within the text. Linguistic steganography covers all the techniques that deal with using written natural language to hide secret message. This research presents a linguistic steganography for scripts written in Arabic language, using kashida and Fast Fourier Transform on the basis of a new technique entitled subtraction of two random Images (STRI) as location to hide a secret message. The proposed approach is an attempt to present a transform linguistic steganography using levels for hiding to improve implementation of kashida, and improve the security of the secret message by using subtraction two random Images (STRI). This method was tested in terms of security and capacity, transparency, and robustness and this is way better than previous methods. The proposed algorithms ideal for steganographic properties. احدى المشاكل الرئيسية في الإنترنت هو الأمن، ازدادت هذه المشاكل مع استخدام الحاسبات في المجالات الاجتماعية والعمل. لذا، فان اخفاء الاتصالات السرية من خلال القنوات العامة والخاصة هدف رئيسي للبحوث. إخفاء المعلومات احد الأساليب للحصول على وسيلة اتصال أمن وحماية البيانات أثناء إرسالها. هذا البحث يقدم طريقة جديدة باستخدام مستويين للاخفاء، المستوى الأول يخفي عن طريق دمج والإضافة ولكن المستوى الثاني يخفي عن طريق الحقن. تضمين الرسالة السرية في المستوى الأول بت واحدة في LSB في FFT وإضافة كاشيدة واحده. عن طريق طرح صورتين عشوائيتين (STRI) هو RNG للعثور على المواقع التي يتم الاخفاء النص داخلها. المستوى الثاني هو حقن واحدة أو اثنين من الكاشيدة العشوائية داخل النص. إخفاء المعلومات اللغوي تغطي جميع التقنيات التي تتعامل مع استخدام كتابة اللغة الطبيعية لإخفاء رسالة سرية. هذا البحث يقدم إخفاء المعلومات اللغوي للنصوص مكتوبة باللغة العربية، باستخدام كاشيدة وتحويل FFT على أساس استخدام تقنية جديدة بعنوان طرح من صورتين عشوائيتين (STRI) لإخفاء رسالة سرية. النهج المقترح محاولة لتقديم تحويل إخفاء المعلومات اللغوي باستخدام مستويات لاخفاء لتحسين تنفيذ كاشيدة، وتحسين أمن الرسالة السرية باستخدام طرح صورتين العشوائيتين (STRI). تم اختبار هذه الطريقة من الناحية الأمنية والقدرات، والشفافية، ومتانة، وهذه الطريقة هي أفضل من الطرق السابقة. ان الخوارزمية المقترحة هي الأمثل من حيث خصائص إخفاء المعلومات. One of the challenging and active research topics in the recent years is Facial Expression. This paper presents the method to extract the features from the facial expressions from still images. Feature extraction is very important for classification and recognition process. This paper involve three stages which contain capture the images, pre-processing and feature extractions. This method is very efficient in feature extraction by applying haar wavelet and Karhunen-Loève Transform (KL-T). The database used in this research is from Cohen-Kanade which used six expressions of anger, sadness fear, happiness, disgust and surprise. Features that have been extracted from the image of facial expressions were used as inputs to the neural network to recognize the facial expression .The recognition rate in this research was 90.5%.واحدة من المواضيع البحثية الصعبة والفعاله في السنوات الأخيرة هو تعابير الوجه. تقدم في هذا البحث طريقة لاستخلاص معالم من تعابير الوجه من الصور الثابتة. عمليه استخلاص المعالم مهمة جدا في عمليه التصنيف والتمييز. وتتضمن هذه الدراسه مراحل والتي تحتوي على :التقاط الصور ,مرحله قبل المعالجه, مرحله استخلاص المعالم من اجل توظيفها في عمليه التمييز . هذه الطريقه فعالة جدا في استخراج ميزة من خلال تطبيق التحويل المويجي الهار ومن ثم استخدام تحويل KL-T تم الاختباربالاعتماد على قاعده بيانات كوهن -كاند لست تعابير هي الغضب والخوف والحزن، السعادة والاشمئزاز ومفاجأة. واستخدمت الميزات التي تم استخراجها من صورة تعبيرات الوجه كمدخلات في الشبكة العصبيه من اجل القيام بعمليه تمييز الاشخاص . حقق هذا النظام نسبه عاليه من تمييز الاشخاص وصل الى( 90.5%). Facial expressions --- Haar wavelet --- K-L Transform --- Features extraction --- Neural network. The computer vision branch of the artificial intelligence field is concerned with developing algorithms for analyzing image content. Data may be compressed by reducing the redundancy in the original data, but this makes the data have more errors. In this paper image compression based on a new method that has been created for image compression which is called Five Modulus Method (FMM). The new method consists of converting each pixel value in an (4x4, 8×8,16x16) block into a multiple of 5 for each of the R, G and B arrays. After that, the new values could be divided by 5 to get new values which are 6-bit length for each pixel and it is less in storage space than the original value which is 8-bits.في مجال الكمبيوتر والذكاء الصناعي تطور الاهتمام بخوارزميات تحليل محتوى الصور. ضغط البيانات يقلل من حجم هذة البيانات الاصلية ولكن يعمل بعض الاخطاء. في هذا البحث استخدمت طريقة جديدةلضغط الصور تسمى طريقة خمسة معامل. تتضمن هذة الطريقة تحويل قيمة كل بكسل في البلوك الى مضاعفات الخمسة لكل من مصفوفات الصور الملونة. بعد ذلك القيم الجديدة يمكن ان تقسم على خمسة لنحصل على قيم جديدة والتي طولها ستة بت لكل بكسل وبالتالي تكون بسعة خزن اقل من القيمة الاصلية والتي طولها ثمانية بت. In this work, the technique of attenuation of gamma ray to calculate the density of comet nucleus materials (C/2009 P1 (GARRADD) at different range of energy (0.2- 0.9 MeV). also, the single scattering model for gamma rays has been assumed that photons reaching the detector with scattered only once in the material. The program has been designed and written in FORTRAN language (77 – 90) to calculate the density for molecules using Monte Carlo method was used to simulate the scattering and absorption of photons in semi- infinite material. Gamma ray interacts with the matter by three mainly interactions: Photoelectric effect, Compton scattering and Pair production (electron and positron). On the 137Cs source energy (662 keV), Compton scattering is the dominant interaction. at energies below about 150 keV the Photoelectric effect is significant , While Pair production occurs at energies above twice the electron rest mass energy (1.022 MeV). Both these processes have mass attenuation coefficients that are heavily dependent on elemental composition, which is why only those source energies within the "Compton window" are useful for densitometry. The calculation of our results of the density were compared with the real density and the comparison is very good. في هذا البحث تم استخدام تقنية جديدة باستخدام توهين اشعة كاما في حساب الكثافة لمواد المذنب عند مختلف الطاقات (0.2 - 0.9 MeV). ايضآ، استخدم نموذج الاستطارة المنفردة لأشعة كاما المنعكسة التي تفترض بأن الفوتونات التي تصل للكاشف تستطار مرة واحدة في المادة. استخدمت طريقة مونتي كارلو لمحاكاة استطارة وامتصاص الفوتونات في المواد الشبه لا نهائية حيث تم كتابة برنامج بلغة الفورتران ((77-90 لحساب كثافة الجزيئات . أشعة كاما تتفاعل مع المادة بواسطة ثلاث تفاعلات رئيسية: ظاهرة التأثير الكهروضوئي , استطارة كومبتن و انتاج الزوج (الالكترون والبوزترون). مصدر السيزيوم عند طاقة 662 keV)) , تحدث استطارة كومبتن , عند طاقة اقل من 150 keVتحدث ظاهرة التأثير الكهروضوئي , بينما انتاج الزوج تحدث عند طاقة تفوق الكتلة السكونية مرتان ((1.022 MeV كلا الظاهرتين معامل التوهين الكتلي يعتمد على تركيب العناصر, لذلك فأن ظاهرة كومبتن مفيدة للقياس. نتائج الكثافة المحسوبة نظريآ مقارنة بالكثافة الحقيقية جيدة جدا. Comet --- density --- Mass attenuation coefficient --- Compton scattering --- Monte Carlo Simulation --- Single scattering Model. In this work the Aluminum plasma in Air produced by Nd: YAG pulsed laser, (λ = 1064 nm, τ = 6 ns) has been studied with a repletion rate of 10 Hz. The laser interaction in Al target (99.99%) under air atmosphere generates plasma, which is produced at room temperature; with variation in the energy laser from 600-900 mJ. The electron temperature and the electron density have been determined by optical emission spectroscopy and by assuming a local thermodynamic equilibrium (LTE) of the emitting species. Finally the electron temperature was calculated by the Boltzmann plot from the relative intensities of spectral lines and electron density was calculated by the Stark-broadening of emission line. في هذا العمل تمت دراسة بلازما الألومنيوم في الهواء الناتجه بواسطة الليزر النبضي : -YAG Nd (λ = 1064nm ،ns τ = 6 ) بمعدل 10 هرتز. تفاعل الليزر في منطقة الهدف Al (99.99٪) في الهواء الطلق يولد البلازما، التي يتم إنتاجها في درجة حرارة الغرفة. مع اختلاف في طاقة الليزر 600-900 ملي جول. وقد تم تحديد درجة حرارة الإلكترون وكثافة الإلكترون بواسطة طيف الانبعاث الضوئي وبافتراض نظرية التوازن الحراري الموضعي (LTE) لمناطق الانبعاث. وأخيرا تم حساب درجة حرارة الإلكترون من مخطط بولتزمان للخطوط الطيفية,وتم حساب كثافة الإلكترونات بواسطة نظرية توسيع ستارك لخط الانبعاث. In this research, the mutual correlations between ionospheric parameters (MUF, OWF and LUF) have been suggested. The datasets of the MUF and OWF parameters have been generated using ASAPS international communication model, while the LUF parameter has been calculated using the REC533 model. The calculations have been made for the connection links between the capital Baghdad and many other locations that spread over the studied zone (Middle East region). The annual time of the years (2009 & 2014) of solar cycle 24 has been adopted to make the investigation in order to get the mutual correlation between ionospheric parameters. The test results of the annual correlation between ionospheric parameters showed that the mutual correlation between MUF & OWF is simple and can be represented by a linear regression equation, while the mutual correlations between (MUF & LUF), (OWF & LUF) can be represented by a fourth order polynomial equation (Quartic Polynomial Equation). The results of the conducted study showed that there was a good fit between ionospheric parameter values that have been generated using the suggested mutual correlation equation and the results generated from the international communication models and the international recommended criterion.تم في هذا البحث أقتراح العلاقة التبادلية بين المعاملات الايونوسفيرية (MUF, OWF و LUF) لطبقة الايونوسفير فوق منطقة الشرق الاوسط. مجموعة البيانات الخاصة بالمعاملات الايونوسفيرية (MUF, OWF) تم توليدها باستخدام النموذج العالمي ASAPS الذي يعتبر احد اكثر نماذج الاتصالات العالمية دقة وتقدماً في مجال دراسة انتقال الموجات الراديوية ذات الترددات العالية. بينما تم حساب قيم معامل الـ (LUF) باستخدام النموذج REC533 الذي يعتبر احد أصدارات منظمة الأتصالات العالمية الحديثة للبث الاذاعي. تم أجراء الحسابات لوصلات الأتصال بين العاصمة بغداد والعديد من المواقع الأخرى المنتشرة فوق نطاق منطقة الدراسة (منطقة الشرق الأوسط). للفترة السنوية للعاميين 2009 و 2014 من الدورة الشمسية 24 والني تم أختيارها لأجراء الدراسة من أجل الحصول والتوصل الى العلاقة التبادلية بين المعاملات الأيونوسفيرية. اظهرت نتائج الأختبارات السنوية أن العلاقة التبادلية بين المعاملات الأيونوسقيرية الـ MUF وOWF هي علاقة بسيطة يمكن تمثيلها بمعادلة الأنحدار الخطي، اما العلاقة التبادلية بين معاملات الـ MUF وOWF مع معامل الـ LUF فيمكن تمثيلها بعلاقة متعددة الحدود للمرتبة الرابعة. بينت نتائج الدراسة الحالية أن هنالك تطابق جيد بين قيم المعاملات الأيونوسفيرية المحسوبة من معادلة العلاقة التبادلية المقترحة وتلك النتائج ااتي تم حسابها من تنفيذ نماذج الأتصالات العالمية والمعيار العالمي المعتمد. Optimum Working Frequency (OWF) --- Ionospheric Parameters --- Lowest Usable Frequency (LUF) --- Radio Wave Propagation. Geodesy is concerned with the relative positioning of points and the gravity field of the earth. For this task, a well-defined coordinate system is needed on which measurements are normally tied to a set of reference points called a geodetic datum (geoid or ellipsoid). The Global Positioning System GPS gives accurately the three-dimensional position of a point (latitude, longitude, and ellipsoidal height) and can measure under all weather conditions. The coordinates of the GPS reference to the World Geodetic System1984 (WGS 84), a global ellipsoid having its origin as the mass center of the earth, and height, referenced to the surface of the ellipsoid . In this research , using RTK-DGPS technique Data collection for study local and leveling, and Earth Gravitational Models (EGM2008,EGM96 ) for determined to geoid undulation utilized 2D polynomial models , and then Using a surface interpolation (kriging) approach, the coordinate and the computed geoidal heights of some well selected points .علم الجيوديسيا يختص بتحديد المواقع النسبية للنقاط بالنسبة الى مجال الجاذبية للارض .لهذه المهمة,نظام الاحدائيات الدقيق يحتاج الى قياسات ترتبط عادةً الى مجموعة من النقاط المرجعية تسمى (الجيود او الاهليلجي ) , نظام تحديد المواقع العالمي يعطي بدقة موقع ثلاثي الابعاد للنقطة ( خطوط الطول والعرض , والارتفاع الاهليلجي ) ,ويمكن القياس تحت جميع الظروف الجوية , احداثيات لنظام تحديد المواقع العالمي مرجع لنظام الجيوديسي العالمي 1984 , وجود الاهليلجي العالمي اصله من مركز كتلة الارض و مرجع الارتفاع الى سطح الاهليلجي . في هذا البحث استخدمت تقنية الجي بي اس التفاضل – الرصد المتحرك اللحظي لجمع البيانات للمنطقة واستخدام ميزان التسوية ونماذج الجاذبية الارضبة (2008,1996)EGM لتحديد حيود الجيود باستخدام نماذج متعددة الحدود ثنائية الابعاد , وبعدها تم استخدام طريقة (kriging) لاستيفاء السطوح لارتفاعات واحداثيات الجيود المحسوبة لبعض النقاط المختارة. The tasseled cap transformation (TCT) is a useful tool for compressing spectral data into a few bands associated with physical scene characteristics with minimal information loss. TCT was originally evolved from the Landsat multi-spectral scanner (MSS) launched in 1972 and is widely adapted to modern sensors. In this study, we derived the TCT coefficients for operational land imager (OLI) sensor on-board Landsat-8 acquired at 28 Sep.2013. A newly classification method is presented; the method is based on dividing the scatterplot between the Greenness and the Brightness of TCT into regions corresponding to their reflectance values. The results from this paper suggest that the TCT coefficient derived from the OLI bands at September is the most appropriate for harness these features to calculate the acreage of rice and compare them with the declared areas by the Iraqi Ministry of Agriculture to make sure of their accuracy. تعتبر تحويلة الغطاء الخضري (TCT) أحد الأدوات المفبدة لضغط البيانات الطيفية إلى عدد من الحزم المرتبطة بخصائص المشهد االفيزيائية مع فقدان الحد الأدنى من المعلومات. تطورت تحويلة الغطاء الخضري أصلا من صور الماسح الضوئي للاندسات متعدد الأطياف (MSS) الذي أطلق في عام 1972 والذي تم تطويره ليتلائم مع نطاق واسع من صور أجهزة الاستشعار الحديثة. في هذه الدراسة، تم تسخير معاملات الغطاء الخضري للتعامل مع صور الحزم الناتجة من القمر لاندسات-8 لتصوير الأرض (OLI) الملتقطة في شهر أيلول في عام 2013. تم في هذا البحث تقديم طريقة جديدة لتصنيف مناطق الصور الفضائية. تعتمد هذه الطريقة على تقسيم مخطط التبعثر بين حزم الإخضرار والسطوع للغطاء الخضري إلى مناطق إعتماداً على قيم إنعكاسيتها. تشير نتائج هذه الدراسة إلى أن معاملات الغطاء الخضري المستمدة من صورة شهر إيلول هي الأنسب لتسخير هذه الميزات لحساب المساحات المزروعة بالرز ومقارنتها مع المساحات التي أعلنتها وزارة الزراعة العراقية للتأكد من دقتها.